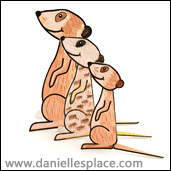 Children will love playing with these meerkat paper 3D figures. 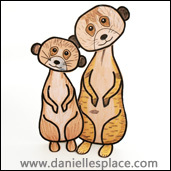 They come in three different sized templates and two different poses so a whole family of meerkats can be created. Laminate the figures so children can play with them outside in their sand box. They will enjoy creating their own Meerkat Manor and acting out the stories in the popular television show. 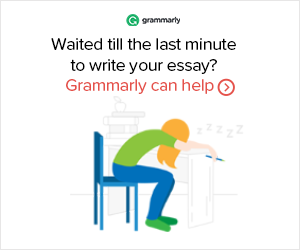 These make great learning tools for home school. Have your children color the figures to match different species of mongoose and research their eating habits and habitats. 2. Color the pattern pieces and then cut them out. 3. To make the side view meerkats fold the body patterns in half and glue a head to each side of the body. Fold the tail in half and glue it to the bottom of the meerkat so it sticks straight out and supports the figure. 4. To make the front view meerkats fold up the feet, glue the head to the neck and fold up the end of the tail and glue it to the back of the body pattern so that it supports the figure. *Fun Fact - Meerkats use their tails to balance when standing. These paper meerkats also use their tails to balance and keep themselves upright. Sunny Meerkat lives in the Kalahari Desert with his family, but he isn't satisfied because it is too hot and his family is just too close. He wishes he could live somewhere else so he packs his things and takes off to find the "perfect" place to live. He visits relatives in Africa, India, and Madagascar having a great adventure, but soon finds out that the only place that is perfect is his own home where everyone is close. This book is unique in that it includes notes from Sunny Meerkat in the form of postcards that are attached to each page. The postcards can be flipped to read both sides, and include facts about different types of mongoose. Children learn how each type of mongoose lives, the food it eats and what type of habitat it lives in. The book also stresses the fact that there is safety in numbers. The illustrations are endearing and whimsical including a photo album of Sunny's travels and family members. 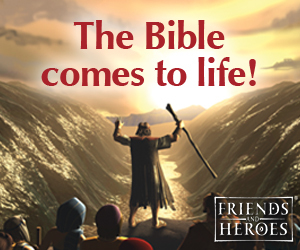 Children will love this book. They will spend hours just looking at all the pictures. 1. Writing Postcards - Visit a local tourist attraction and purchase some postcards. Have your children study Sunny's postcards and use them as a sample on how to write a postcard. Have them send the a postcard to a friend of relative. 2. Science and Geography - Research each of the different species of mongoose mentioned in the story, write facts about each species, compare and contrast their eating habits, enemies, and habitats. 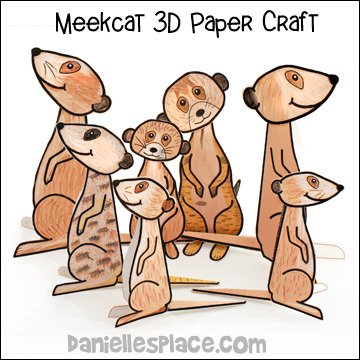 Use the Meerkat 3D Paper Craft above and color the patterns to match the descriptions of each mongoose. Have your children find the different places on a map where Sunny visited his relatives. 3. Science - The jackal shows up in just about every page of the story. Research enemies of the meerkat. What is its greatest enemy? See if you can find the jackal in each picture. 4. Math - Sunny lives in the Kalahari Desert and thought it was too hot there. Find out how hot and cold it gets in the Kalahari and compare it to where you live. How much hotter or colder does it get? 5. Art - Have your children create their own travel journal or family scrapbook. Help them label each picture or include a short description. 6. Safety - Ask your children if they remember what the meerkats' motto was, "Stay safe, stay together." Discuss the importance of staying together. Ask them what they think their family motto should be. Help them make a sign with the motto to hang up in a conspicuous place in their home. 7. Creative Writing - Have your children use the book as an example to write their own story using a different animal or using themselves as the main character. 8. Connecting - Ask your children why they think Sunny was not happy at home. Ask them if they ever felt like they wanted to leave home to find somewhere better to live, and if they think they could find such a place. Encourage them to share what they like about where they live, and what they don't. Can they change the things they don't like? Discuss the meerkats' family motto and ask your children if they can think of a family motto for their family that might help them all get along better. They might say something like, "Respect others' belongings", or "If you don't have something nice to say, don't say anything at all". Have your children make up a large sign with the new family motto to hang in a conspicuous place. 9. Other Ideas - For other learning activities, pictures of illustrations from the book, videos, and an interview with the author go to Booktrust Children's Books web site.